A defiant Donald Trump was dismissive of his critics Friday, especially GOP House Speaker Paul Ryan, who said he was not ready to endorse the leading Republican candidate until he does more to unite their fractured and shell-shocked party. Trump responded on Thursday by saying that he was not ready to support Ryan’s conservative House agenda. The former reality TV star mocked him again Friday for saying that Trump had “inherited” something special in politics and needed to behave in a more thoughtful, statesman-like manner. “I didn’t inherit it, I won it with millions of votes,” Trump tweeted. But the brash real estate magnate -- who stunned the political world this week by roaring to victory in the Indiana GOP primary, blowing away his two remaining competitors, Sen. Ted Cruz (TX) and Ohio Governor John Kasich -- continued to draw flak from both sides of the political aisle. President Obama – who is certain to lead the charge in support of former secretary of state Hillary Clinton’s candidacy this fall -- derided Trump at a White House news conference and chastised the media to take a closer look at the billionaire’s controversial statements and business record. Meanwhile, Sen. Lindsey Graham (SC), a one-time rival of Trump’s for the GOP presidential nomination, joined a growing chorus of Republicans saying they couldn’t support the billionaire for president and won’t attend the national convention this summer to see him nominated. “It’s hard to believe that in a nation of more than 300 million Americans Hillary Clinton and Donald Trump will be our choices for president," Graham said in a statement. Graham also said he would "absolutely" not support Clinton, claiming she represents Obama’s third term. He acknowledged that some of his “best friends” will support Trump come November. Trump’s virtual takeover of the GOP after waging one of the most unorthodox and politically divisive presidential campaign in memory is turning the party into a series of armed camps, raising the specter of civil war by the time of the national convention in Cleveland in July. Leaders such as Ryan and Senate Majority Leader Mitch McConnell (R-KY), who has endorsed Trump, are not doubt concerned about how the controversial Trump will perform in challenging Clinton for the keys to the White House, and also how he will affect down-ballot races, especially with the Republicans’ current narrow majority in the Senate in jeopardy this fall. Veteran GOP pollster Bill McInturff earlier this week predicted that Trump would fall to Clinton in November because of his high negatives among many groups of voters. 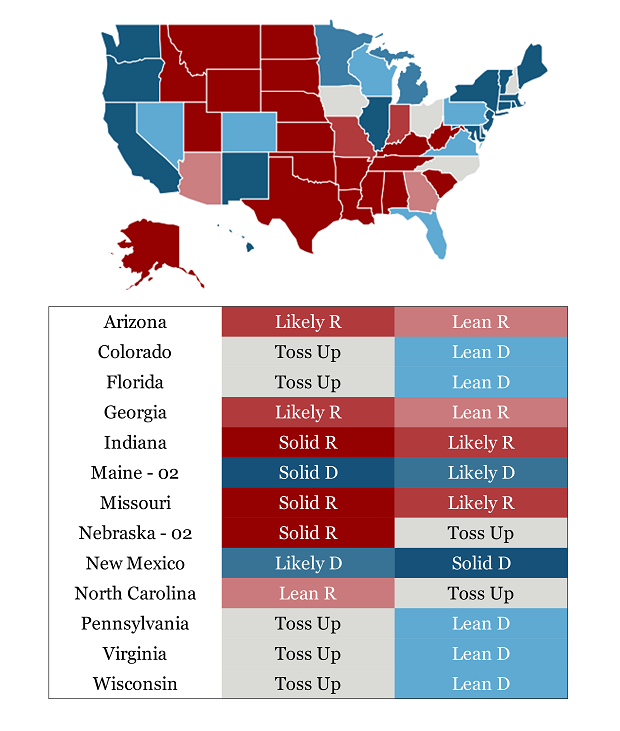 At the same time, in the Electoral College the “solid Republican” states of Missouri and Indiana were downgraded to “likely Republican.” New Mexico is now considered to be solidly in the Democratic column, while North Carolina is a toss-up after “leaning” Republican. The new map suggests Trump’s negative comments about women and minorities could come back to haunt the GOP on Election Day. Graham went after Trump’s latest antics, ripping the billionaire’s latest Hispanic “outreach” in which he tweeted a photo of himself eating a taco bowl. “Eating a taco is probably not going to fix the problems we have with Hispanics. I think embracing Donald Trump is embracing demographic death,” Graham said. And in another growing trend, the South Carolina lawmaker added his name to the list of elected GOP officials who will skip the Republican convention this summer. "I think it will be one hell of a party. I'm just glad it's in Cleveland, not in Area 51."